Main mass of nakhlite NWA 998. Photo Copyright Adam and Greg Hupe. Assembled complete stone of shergottite NWA 1195 showing interior. Photo Copyright Adam and Greg Hupe. The fertile hunting grounds of the western Sahara have turned up two more Martian meteorites, bringing the total number of unpaired examples to 26. Both were recovered and confirmed by the same team of investigators based in Seattle (USA). Adam and Greg Hupe, in collaboration with Drs. Anthony Irving and Scott Kuehner at the University of Washington, acquired and analyzed a new orthopyroxene-bearing nakhlite (NWA 998) and a new olivine-phyric basaltic shergottite (NWA 1195), which were found by separate nomadic groups in western Algeria or eastern Morocco (full descriptions submitted to the Meteoritical Bulletin are given below). The new nakhlite (Images 1 and 2) is the sixth known example and has unique features including the presence of minor orthopyroxene accompanying the dominant subcalcic augite, intergrowths of titanomagnetite and low-Ca pyroxene (Image 3; suggesting a post-crystallization, high temperature oxidation event), and secondary carbonate, sulfate and possibly hydrous minerals (which may be products of weathering or other alteration processes on Mars). Oxygen isotope analyses by Dr. Douglas Rumble at the Carnegie Institution (Washington, D.C.) have confirmed its kinship with other Martian meteorites. 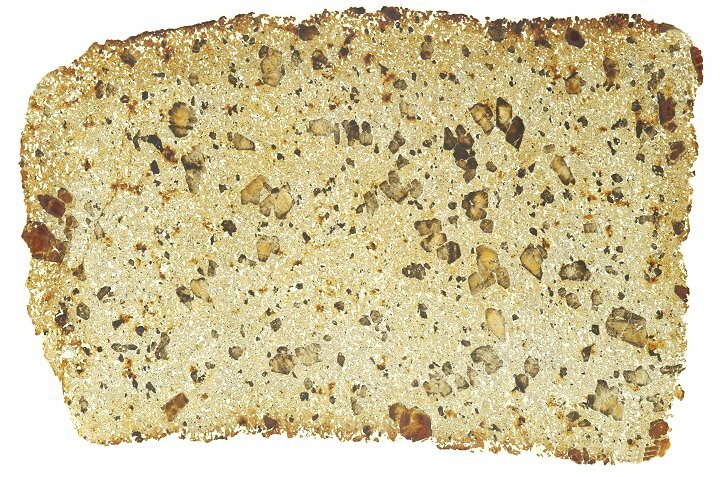 The new basaltic shergottite, which has an unusual elongated shape and a distinctive weathering rind (Images 4 and 5), is the fourth known example of a subgroup (including DaG 476, SaU 005 and NWA 1068, and respective paired samples) characterized by relatively large olivine megacrysts in a finer grained groundmass composed mainly of pigeonitic pyroxene and shocked plagioclase (maskelynite). Scientists continue to debate whether some or all of the olivine megacrysts in these samples represent phenocrysts grown from the magma that produced the groundmass, or xenocrysts captured from subsurface rocks or mixed in from possibly related, partially crystallized subsurface magma batches. 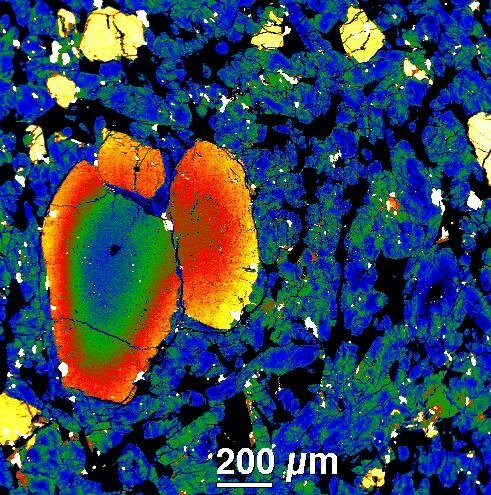 Most of the olivine crystals in NWA 1195 have well developed crystal faces suggesting that they are phenocrysts (Images 6 and 7), and the cores of the compositionally zoned olivine grains are the most magnesium-rich yet found in Martian samples (indicative of a relatively unfractionated magma from the interior of the planet). The successful recovery of these rare and important meteorites required a team approach among dealers, collectors and scientists sharing a common interest in their pursuit, preservation and study. 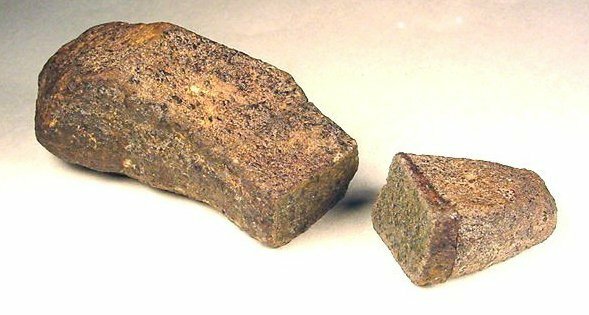 The Martian stone now designated NWA 998 was rumored to exist in Morocco as early as September, 2001 at a time when international travel was out of the question. Tucson dealers Mike Farmer and Jim Strope, trusting their sources, took this rumor seriously and played a key role in the acquisition. Adam and Greg Hupe were invited into the pursuit of this mysterious stone because of its extremely high asking price, although they held little hope that it actually existed. The Hupe brothers have invested considerable resources in the pursuit of other such fantastic stones only to come back empty handed. Once the stone was confirmed to really exist, a deal was finalized at the Tucson Gem and Mineral Show in February, 2002, where it realized a record wholesale price, many times more than any other meteorite purchased in this manner. This new nakhlite is believed to have been found in western Algeria, but this is hard to confirm because the Berber nomads will not disclose its exact location, and, despite a promised thorough secondary search, no more has been recovered. The recovery of shergottite NWA 1195 followed a different path. Adam and Greg Hupe spent months educating Moroccan dealers to look for unusual stones among batches of meteorites, and also to document which nomads found good stones so that additional pieces might be recovered. In the past, any stone that was not magnetic or lacked a fusion crust was usually cast aside and forgotten. The Hupe brothers financed the high costs of this untested recovery method with few results until a shipment of suspected meteorites arrived in Seattle in March, 2002. A 50 gram stone with no fusion crust was pulled from a group of terrestrial stones by Adam Hupe, who suspected that it might be a shergottite. The next day a thin section was prepared in excited anticipation by Dr. Anthony Irving and David McDougall at the University of Washington and revealed the characteristic presence of maskelynite. Full confirmation required expert electron microprobe analysis by Dr. Scott Kuehner. 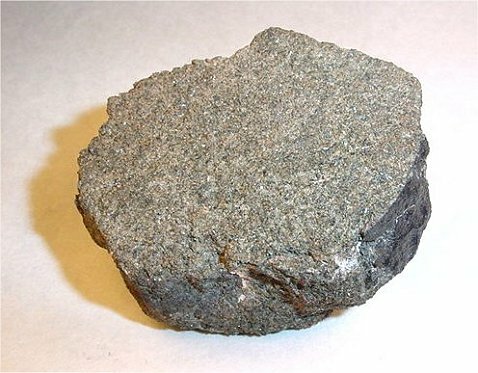 Since careful notes had been made on which nomadic group found this stone, a search for more of this material was initiated and within a week another 265 gram stone was recovered 15 meters from the original in the Safsaf region of eastern Morocco. Greg Hupe then embarked on a grueling 36-hour trip to Morocco and spent four days with nomads in the desert to retrieve the new find. Greg brought along the end portion cut off the 50 gram stone and was delighted when it fit perfectly to the newly acquired 265 gram stone, thus reuniting this meteorite with its broken counterpart after weathering separately for thousands of years. Image 1: Main mass of nakhlite NWA 998. Photo Copyright Adam and Greg Hupe. 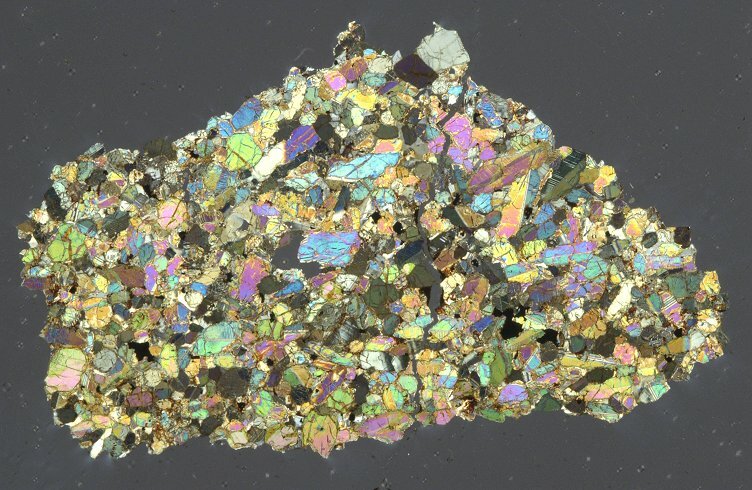 Image 2: Thin section image (11 mm by 6 mm) in partially cross-polarized light of NWA 998 showing abundant prismatic augite, olivine (green), orthopyroxene and titanomagnetite (black). Photo Copyright Adam and Greg Hupe. 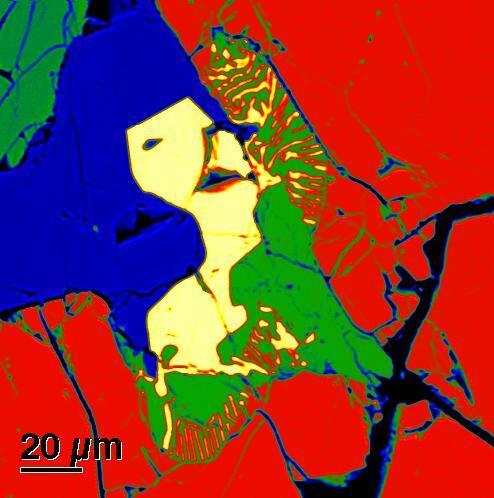 Image 3: False-color backscattered electron image of NWA 998 showing a symplectitic intergrowth of titanomagnetite (beige) and low-Ca pyroxene (green) at a contact between olivine (red) and titanomagnetite (beige) adjacent to plagioclase (blue). Photo Copyright Adam and Greg Hupe. Image 4: Assembled complete stone of shergottite NWA 1195 showing interior. Photo Copyright Adam and Greg Hupe. 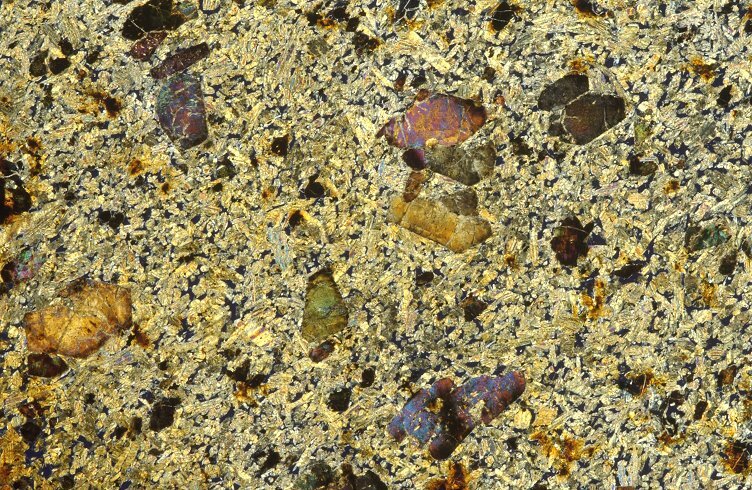 Image 5: Thin section image (29 mm by 19 mm) in plane light of NWA 1195 showing the thin terrestrial weathering rind (reddish brown) and porphyritic texture, with large olivine phenocrysts (brown and yellow) in a groundmass of pigeonite (pale yellow) and maskelynite (white). Photo Copyright Adam and Greg Hupe. Image 6: Thin section of NWA 1195 in cross-polarized light showing euhedral olivine phenocrysts in a groundmass of pigeonite (yellow) and maskelynite (black). Photo Copyright Adam and Greg Hupe. Image 7: False-color backscattered electron image of NWA 1195 showing large, zoned, euhedral olivine phenocrysts (left center), smaller olivine grains (yellow), zoned pigeonitic pyroxene (blue and green), maskelynite (black) with chromite and pyrrhotite (white). Photo Copyright Adam and Greg Hupe. by 65 mm by 48 mm. Classification and mineralogy (A. Irving and S.
grain boundaries and within cracks in augite. Oxygen isotopes (D.
FMNH, and two polished thin sections, UWS; main mass, Hupe. remainder of the same elongated stone (total weight 315 g). Dimensions of the reassembled stone are 133 mm x 43 mm x 37 mm. polished thin sections, UWS; main mass, Hupe.